Scientistshave found no indications so far of water in the first soil sample delivered toNASA's Mars Phoenix Lander, they announced on Monday. Afterfinally successfullydelivering the sample to the Thermal and Evolved-Gas Analyzer (TEGA) on June11, mission scientists carried out their first two analyses of the sample overthe weekend. During the first, the sample was heated to 95 degrees Fahrenheit(35 degrees Celsius), in the hopes of melting out any water ice in the sample.The sample was further heated up to 350 F (175 C) during the second analysis. "Wesaw no water coming off the soil whatsoever," said TEGA team leaderWilliam Boynton of the University of Arizona. 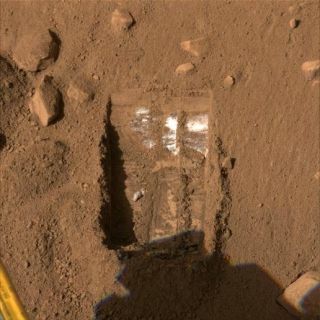 Boyntonsays the team wasn't surprised that they found no indication of water icebecause the sample sat out in the Martian sun for several days while it wasstuck at the entrance to one of TEGA's ovens, which heat up the soil so thatthe instrument's mass spectrometer can analyze the composition of the vaporsthe soil gives off. In the nextfew days, scientists will further heat the sample up, to a maximum of 1,800 F(1,000 C), to vaporize out minerals that might have chemically-bound water,carbon dioxide or sulfur dioxide. "Weexpect there's a high probability that we would find minerals with chemically-boundwater, which would release their water at higher temperatures," Boyntonsaid. Signs ofwater in the minerals would indicate that rocks on the surface once interactedwith liquid water. The twin Mars Exploration Rovers, Spirit and Opportunity, have already found indications of water interacting with surface regolithcloser to the Martian equator. Phoenix has also been expanding its firstdigging sites, uniting what were once two separate trenches, Dodo and BabyBear.The new, expanded trench has been dubbed "Dodo-Goldilocks." Themysterious, unidentified white material exposed in the trench is still visible. Mission scientists are still debating whether this bright, white material isexposed subsurface water ice or salt minerals. "Itcould be ice; it could be salt. We have to sample it to be able to tell,"said Phoenix robotic arm team leader and mission digging czar Peter Arvidson of Washington University in St. Louis. A smallchunk of the material was knocked loose by the robotic arm scoop as itperformed one of its backhoe-like maneuvers in the trench. Scientists will bemonitoring this chunk and expect to see it change if it actually is ice. "If itreally is ice, we expect it to sublimate, or go into the vapor phase,"Arvidson said. Scientistsexpected to find water ice about 7.9 inches (20 centimeters) under the surface,but encountered the unidentified white material about 2.3 to 2.7 inches (6 to 7centimeters) below the surface while digging in one of the trenches bordering apolygon. Arvidson said they hope to see whether they encounter the whitematerial at this depth inside the polygon. Samplesfrom Wonderland will be delivered to TEGA and the Microscopy, Electrochemistryand Conductivity Analyzer (MECA) instruments in the next week or so, Arvidsonsaid.